An up-front note: a mate in the whisky community, Andy, gave me a sample of this venerable whisky, as he now has some involvement with the company. Truth be told, he slipped me a sample of this in our shared cottage during the Spirit of Speyside festival earlier in the year and when he was blabbing on about what it was I had half tuned out. He talks a lot, does Andy. Anyway, what he actually passed over was a sample of a very interesting blended malt whisky called Sennachie. It’s only been available from the the Carnegie Whisky Cellars in Dornoch, and commands a price of £500. 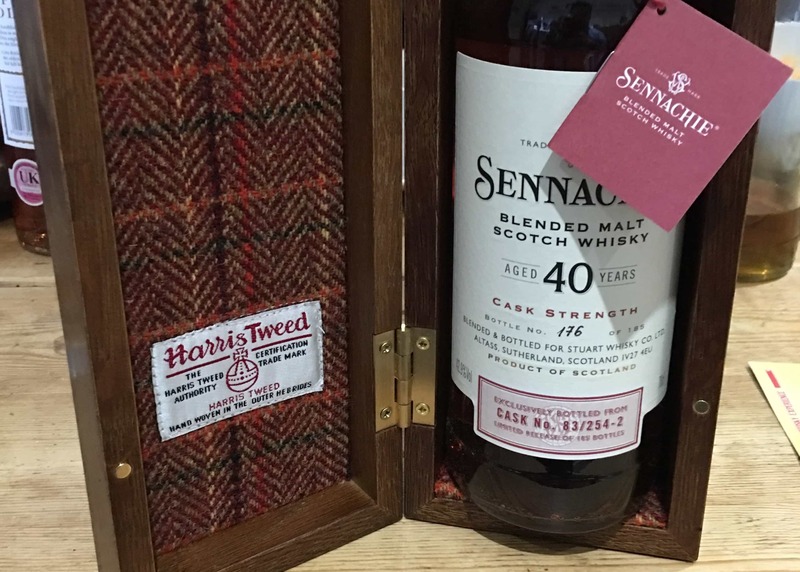 For that, you also get a solid oak box inlaid with Harris Tweed woven by Donald John Mackay MBE. But what about the whisky? 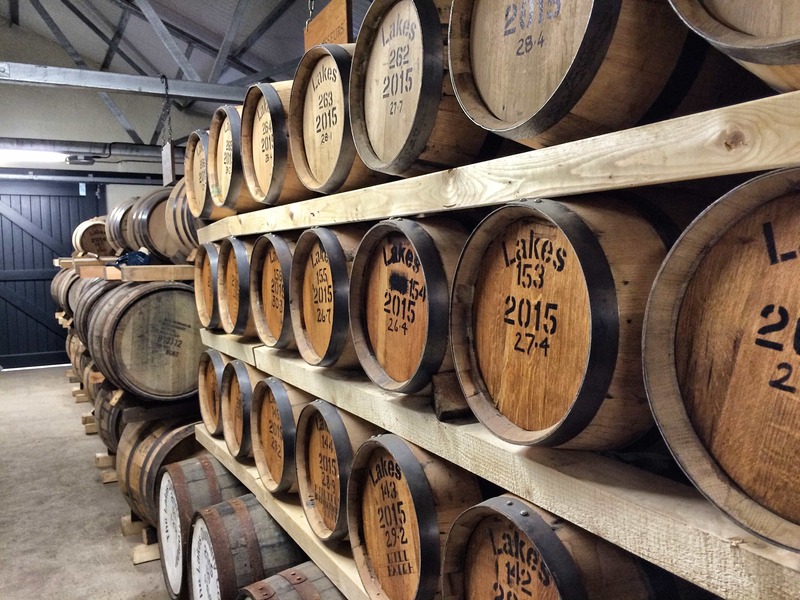 Most of the (rather intriguing, but Speyside and Highland) component single malts were distilled in 1975, before being married in a couple of hogsheads some time in 1983 – and left to get on with it. In a final quirk of fate, the whiskies then spent three decades at Springbank distillery. So the intro to this review is regrettably short: I’ll put that down to my fuzzy head during a whisky festival. On the nose: beautiful, with a wide range of flavours contributing. There’s a high-end floral note, jasmine or honeysuckle, very perfumed; at the low-end is this bass Springbank-style dirtiness, with coal dust, linseed oil, olive-style meatiness; and in the middle are dried figs and dried apricots, with heather honey. In the mouth: silky delivery, as one expects from a blended whisky, and again it shadows the nose. Heather honey and dried figs again. There’s a warmth of cinnamon and all-spice, and that Springbank-like intensity (literally no idea if there’s any in here), the oily, earthy bass notes. Salted caramel chocolate. Stewed plums in syrup. The finish is perhaps a little short considering the gorgeous intensity of the mid-palate, but it comes with warming stem ginger and a touch of all spice again. Lovely, lovely whisky. Very complex, with a brilliant array of flavours, although the taste doesn’t quite live up to the glorious aromas. For the price it’s annoyingly drinkable too. 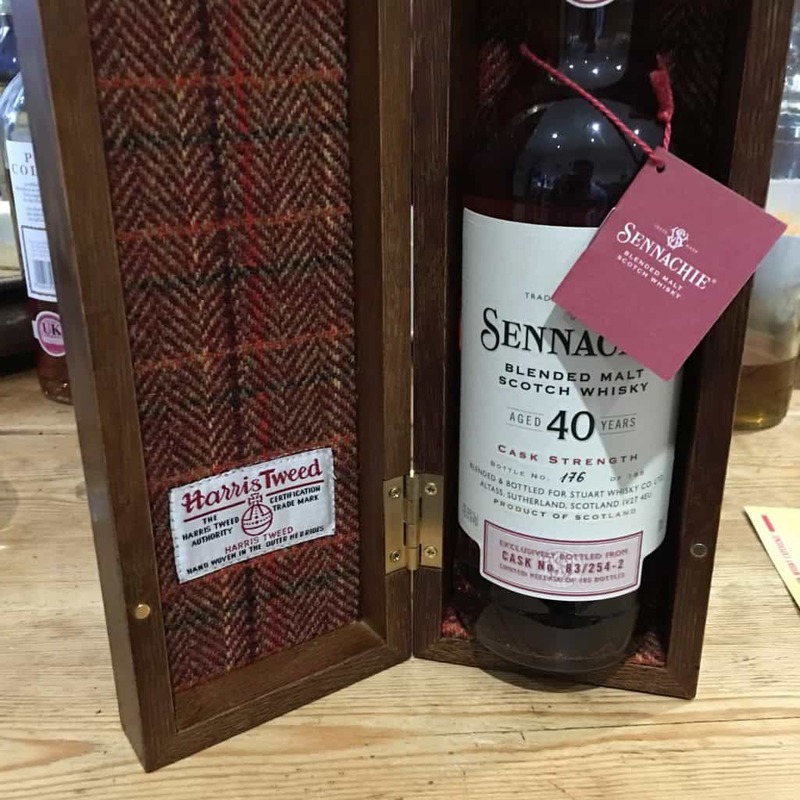 Would I pay £500 for this, as an ordinary whisky punter? I guess if I was told the components (and I’m sure those selling it to you would blab) then that might sway. £500 does tend to be an “average” figure for a single malt of this age, so I don’t think it’s out of the ordinary these days. Full disclosure always here at Whisky Rover, this sample was given to me by Andy, who is not only a good friend and an Ardbeg..